Getting the money together for a down payment can be hard for the average person. Even when using helpful federal programs such as FHA loans, VA loans or USDA loans that come with low down payments it is sometimes difficult. The good thing is, you don’t have to do it alone. If you have friends or family that can help you out, it is possible to use the gifts they provide toward a down payment. Spouses can even gift money to their partner for a down payment. There are several sources for this type of money from relatives, and all can be legally used as a down payment for a loan as long as the home buyer follows the proper procedures. There is a proper way to go about using money from gifts toward a down payment. If you do not know the rules, you may find yourself being rejected for a loan by your lender. It’s helpful to understand that you are not the first person to ever need help scraping up a down payment. Gifts from friends and family for a down payment are common, and that is why the industry has made concessions for that happening. It isn’t even just first time home buyers that need help. Repeat buyers, buyers looking to move up to a more expensive home also need help a lot of time. There are even loved ones who will refinance for an equity loan to get a beloved relative the money for a 20% down payment. Why 20%? Getting up enough cash for a serious down payment can mean the difference between a high interest rate and the best rates available. With today’s interest rates at rock bottom levels, it is a good idea to cash in on the best in town and get the lowest rate possible. Home owners with 20% of the purchase price available can also consider top lending instution loans such as Fannie Mae and Freddie Mac, who offer better savings on costs and far better terms than many lenders. Home buyers may want a higher down payment in order to qualify for the loans with caps on them as well. The 2015 cap on a conforming loan is $417,000 across most of the country with exceptions in “high cost” living areas such as New York, Los Angeles, Washington D.C. and San Francisco. High cost areas like San Diego, CA may have a cap set at $625,500 as a total amount for a single family home or $1,202,925 for a multi-family home. Using a down payment to lower the amount of a mortgage is a good way to stay in the conforming limits and get the advantages of a standard loan, including low interest. 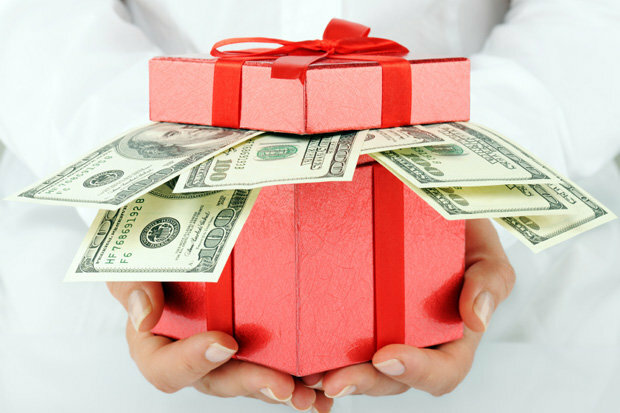 Cash gifts can be used for other things rather than a down payment as well. Cash gifts can be used to buy down interest rates at closing, known as paying points. Cash gifts may also go toward repairs on a home, creating an emergency fund for future repairs or replacements, furnishings, appliances or other helpful situations and still be considered a cash gift. The process toward accepting a cash gift properly is shown below. The last part is vital to the acceptance of a cash gift. The lender is most concerned with the fact that large sums of money may be loans instead of gifts. They do not want to find out later that they lent the home owner money for the purchase of a loan, but they are in line with others who also lent money and expect it repaid. That could upset the debt to income ratio of the home owner, and make it hard for them to afford proper, timely payments. Avoid writing letters that are too long. Simply provide all of the necessary information. The person gifting the money to you needs to keep accurate records of any transactions that occurred in order to provide the gift. That means, if a home was refinanced for equity in order to give you the proceeds for a down payment, the person refinancing must keep accurate records and provide you with copies of the transaction as proof. If the giftor cashed in stocks or bonds in order to accumulate the money for the gift, receipts should accompany the cash gift. Gifts should always come in the form of a personal check for the exact amount shown on the gift letter. Both the giftor and the giftee should keep a copy of the letters and all receipts for the transaction. The giftor may wire the money to the giftee, but it may require more paperwork. It is easier for the lender to document a personal check and track it than to follow the trail of a wire transfer. Finally, once all of the paperwork is handled, and the cash gift has exchanged hands, the home buyers should immediately deposit the money into a bank. This transaction should take place in person. It can be walked in to any preferred depository such as Wells Fargo Bank, Bank of America or Chase. Do not use an app over the phone, or an ATM machine to make the deposit. Make sure you get a receipt for the transaction from the bank. Do not make more than one deposit at that time. The only deposit that should show up on the receipt you get at the time of the deposit is the cash gift deposit in the same amount specified in the letter. If you are getting more than one cash gift for your down payment or other needs, make sure you follow these steps for each one separately. It is also important to be sure that the money is being deposited into the bank where you will be drawing your purchase funds for your home’s closing. Having multiple checks drawn on several banks at closing can make it confusing and increase the chances of errors being made. Be aware that you may be liable for income taxes on cash gifts. The IRS allows cash gifts in certain amounts without taxes, but it is a good idea to speak with a qualified tax specialist regarding your liability. Lenders do not report cash gifts the way employers report income, however, should your taxes come into question and an audit be performed, excess cash may be questioned.